Come on BATsters, we need to get more info posted! The first ever BATMAN costume I've ever created. 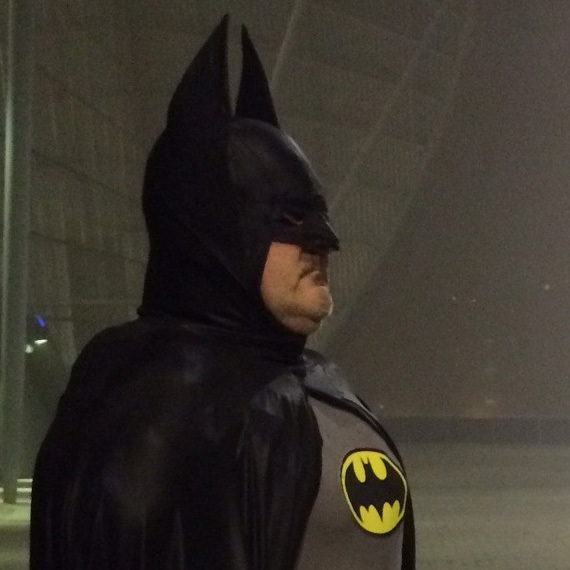 It's been a long time coming, but here are a couple of pics out one Halloween in the BAT Suit! Unfortunately not many pics were taken and these are the best two, but kind'a like where they were taken even though they don't show a great deal. I also didn't have the white eyes in at the time. All material, no rubber or latex and all stitched by my own hands, without a pattern! Will be posting a few taken in the house!